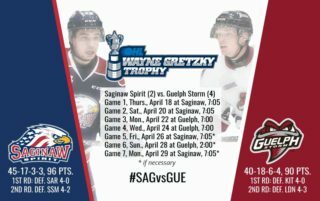 Saginaw, Michigan – Saginaw Spirit team captain Damien Giroux had only scored twice on the season before Saturday’s contest at the Dow Event Center. 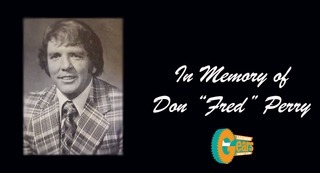 But by the end of the night, the Minnesota Wild draft pick had himself quite a productive outing, completing a hat trick with three goals registered in the third period alone against the North Bay Battalion. The Spirit now sit in second place in the OHL Western Conference standings with 11 points, riding a four-game winning streak that started at Flint on Oct. 3, following the 6-2 finale. Winning the face-off from the left circle inside Saginaw’s zone, the Battalion would grab the opening goal with 5:31 into the first period, as forward Rhys Forhan’s shot immediately after the puck drop earned him his first point of the season. The second goal for North Bay almost seven minutes later was recorded off a wrist shot by defenseman Nick King that went directly into traffic and past a standing Ivan Prosvetov. Prosvetov started in net for Saginaw for the fourth consecutive game, stopping six-of-eight shots after the Battalion took the early 2-0 lead and later nabbing 18 saves. 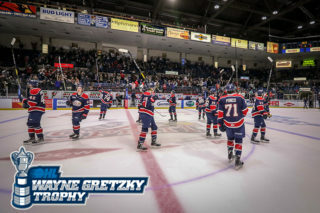 Before New York Islanders prospect Bode Wilde cut the deficit to 2-1 with 2:43 remaining before the first intermission, the Spirit had multiple quality scoring chances denied by Christian Propp, North Bay’s agile goaltender notched 12 saves before the second period. Wilde’s first shot of the frame adjacent to the Battalion bench hit the opposite post, deflecting right to the stick of Giroux. The succeeding captain of Keaton Middleton and 20th in club history stood right in front of an open net but couldn’t put it home. After left-winger Albert Michnac and Forhan were both sent to the penalty box for cross-checking at the 13:29 mark, the 4-on-4 situation made way for rookie Cole Perfetti to have three near perfect looks offensively, all of which occurred in a span of 25 seconds. Wilde’s goal from the blue line is the defenseman’s third in four games. With 10 points on the season, the former University of Michigan commit is second on the team behind right-winger Cole Coskey (13) and Michnac (13). Signs of frustration were imminent when the Spirit had all six of their shots on goals rejected in the second period until 9:21 remaining when fellow 2018 Islanders draft pick Blade Jenkins picked up the game-tying goal. Jenkins had his stick at the right position once Giroux’s attempt inside the slot deflected off the body of Propp. The native of Jackson, Michigan, has finished with at least one point in six games this year. Coming close to seizing the go-ahead goal was the Spirit at the 6:42 mark when forward Nicholas Porco’s shot hit the post. It nearly resulted in the second-year standout tallying his eighth goal of the season, who’s already leading the team in that respected statistic. Giroux, who was taken in the fifth round of the 2018 NHL draft, began his scoring spree with an impressive spin-around backhander inside the slot at the 14:21 mark of the third period, which made it 3-2 in favor of Saginaw. Giroux collected two more goals less than two minutes of each other to complete the hat trick. In his third season with the Spirit, Giroux has never scored more than twice in a single-game before tonight. Michnac, who began the first three games of the season with three goals scored, made it 5-2 with his fifth of the season at 7:36. 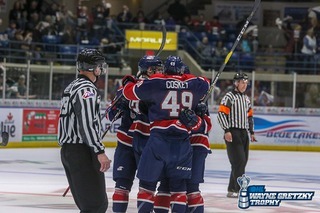 Cole Coskey was awarded with his second assist. Saginaw had 34 shots on goal after being in the double-digits at the end of the first two periods, going 0-for-3 on the power play and winning the face-off battle, 39-21. 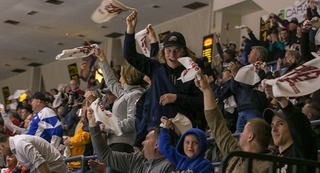 Saginaw will conclude the two-game home stand on Sunday, Oct. 14, hosting the Kitchener Rangers at 5:30 p.m. The Spirit took the first meeting between the two clubs, 4-3 in overtime, Friday, October 5th on the road.